The new Adidas F50 i Tunit boots are one of the most stylish and inventive football boots out this year in this Macaw/White/Black Set and white colour way. 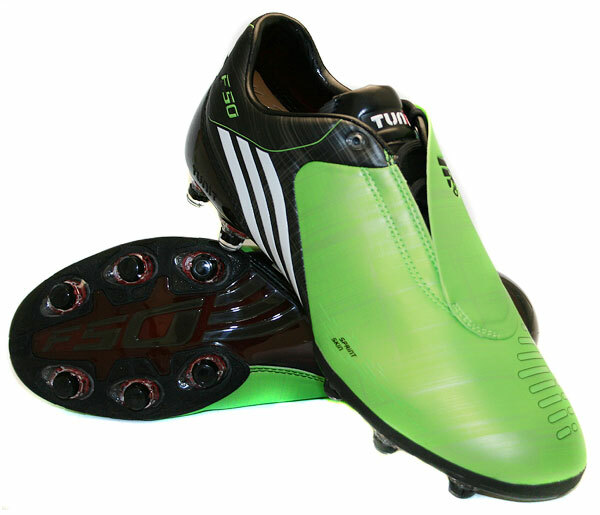 This set features the F50 i Tunit Cyan Sprint Skin Upper in, Comfort Chassis, Stud Key, all 3 sets of colour co-ordinated studs, firm ground (black), soft ground (silver) and hard ground (red). The new upper for the Adidas F50 Tunit boots is stunning, with a new, re-enforced transparent heel design and synthetic forefoot which combine to offer a real look of class and offers great durability. The front of the boots has been modified on the advice of some of the top footballers who wore last years model, so it now has a sleeker toe and better lace cover, the two combining to increase and improve the comfort and kicking area on the boot.